Today, I was driving on a road trip, shlepping athletes home from a tournament on the open highway. 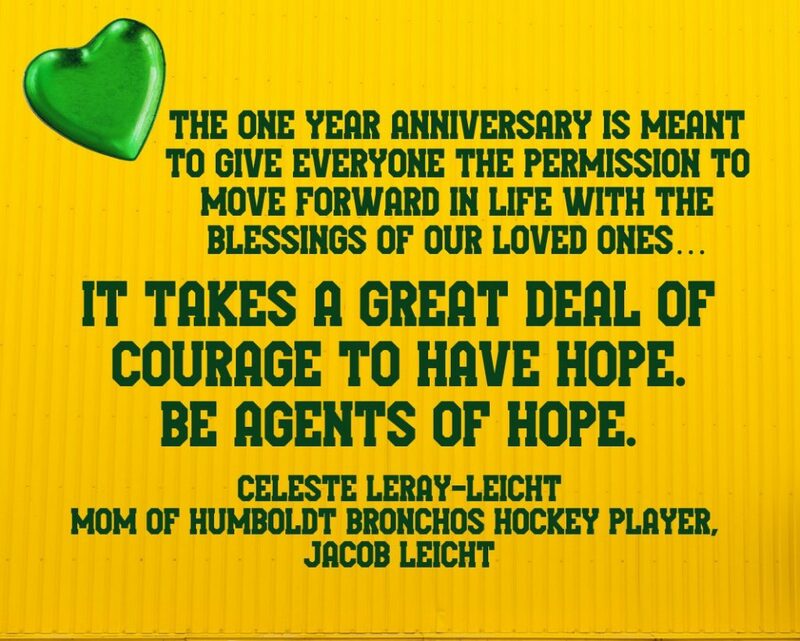 While driving, I listened on the radio to the memorial service taking place in Humboldt to honor those in the Broncos hockey team bus crash. I was struck by the permission that the mothers of two of the deceased, Carol Brons and Celeste Leray-Leicht gave to the survivors of the bus crash, and all those grieving–to move forward. To have hope. Not to forget the grief, but to allow a shift at the one year mark. In the tradition I come from, there was a time in the past when the immediate family members wore black after a death. Black dresses for the women. Black arm bands for the men. Every day, all day. For a whole year. At the one year anniversary, the black dress was put away, and the regular clothing with a variety of colours was worn. The death was not forgotten, but the shift was clear. To the wearer of the clothes. To the rest of the community. At the one year mark, there was a conscious choice to unattach from the daily constant grief. The change in clothing was clear, but I think it was to create a deeper shift as well. With the change from mourning clothes to regular clothes, all had permission to regain the regular routines of life in a more robust sort of way. And maybe, in the giving of permission, there also lies a bit of a nudge too. Some of us, when we grieve, can use a reminder or even a gentle poke to do things that are good for us. I know during times of grief, I have struggled to give myself permission to end the somber time: to laugh in a world where my loved one isn’t or to anticipate and enjoy something when I’m thoroughly used to being only sad. The anniversary of a death can be a time to remember and grieve, to be certain. But perhaps the anniversary is also a time to consciously create a shift from focused mourning to having the grief become part of the fabric of our lives. One of the teachers I had in counselling school used to live in Africa. In the part of the continent where she lived, she said that at the time of death, there was deep and profound grief–expressed sadness. The funeral was about loss. On the one year anniversary of the death, there was a party. It was a joyous occasion. After a year, the contribution of the deceased to the life of the community was celebrated. They were fondly and humorously remembered. There was laughter as the life was celebrated. They taught her about moving forward–which I suspect is distinctly different than moving on. The one year anniversary after a death was a pivot point. The pivot point was a collective supportive moment to turn from the past grief being a focal point–incorporating the sadness into moving forward with hope. To be clear, this sort of message comes best comes from those who mourn…thus, perhaps, the change of dress of the immediate family. It’s manipulative to tell someone to “build a bridge and get over it”. And that is what made the service of Humboldt today so powerful…once again, they teach us about grief. They help us know how to move forward. Their hope and their desire for us to have hope allows us to move through this grief. Though one never has closure on grief–grief is not a bank account or anything else one can just close), there will be a shift. The service in Humboldt seemed to provide a pivot point of sorts for the family members of “the angels”, for the survivors, the first responders, the medical staff, the billet families, the town–indeed, the entire country. Thanx, Humboldt for creating the shift–a pivot point of healing today.